After what seemed a leisurely breakfast, we set out for the Mongolian Plateau, with a climb up through a dramatic pass lined with red-raced craggy rock and sweeping bends, dodging slow-moving trucks grinding up in first gear. Getting to Mongolia first means entering Inner Mongolia. Once that has been accomplished, you then set out for Inner Earth of Outer Mongolia. Confused? With road signs in Chinese navigators had to have their wits about them. The full extent of the early problems of many cars that suffered from six weeks in a tin box on the deck of a ship are now coming to light. Several cars that had not been tested to the full discovered problems on the way to the Great Wall. There were trip-meters that were not working, faulty ignition systems or other electrical gremlins.... one car was a straight forward fix – points had burnt out and with new points fitted in the distributor along with a new condenser was running sweetly again… the event mechanics have been busy with these sort of teething problems. Tim Scott on the solo ride of his life on the FN motorcycle reached Daihai this morning for breakfast having been sleeping on the roadside after a dozen spokes of the rear wheel dropping out puncturing the inner-tube. The sudden flex this caused upset the drive shaft which is thought might have been slightly twisted. This, in turn, had damaged a bearing. He was off to find a blacksmith today to get repairs made. Tim Wilkinson’s Alvis SA arrived in Erenhot tonight on the end of a tow-rope behind Peter and Betty Banham, with rumbles in the engine suggesting bearing trouble… this will be a major overhaul but fortunately Tim had packed a bearing set in his spares kit. Bruce Washington from New Zealand in a Chrysler tourer ran a big-end bearing today, Peter Banham has stripped down the bottom end in the car park and it would appear to have been poorly fitted when the engine was built, but as Bruce has a spare set of shell-bearings, it looks a straight-forward car-park rebuild, and will probably be running before midnight. Andrew Bailey in the Stutz has made faltering progress, admitting that the last minute rush for the boat to China meant the Zenith carburettor probably was jetted wrongly and its been down on power and misfiring since the start – the sweep-mechanics have been busy sorting these sort of gremlins all day. Jose de Sousa’s MG Magnette had its Facet fuel-pumps pack up and was towed into the hotel tonight by the Sunbeam Alpine of David Roberts. Roger Allen and Maggie Gray in their big Cadillac Coupe have a holed radiator and have phoned ahead to say they will be in late tonight. 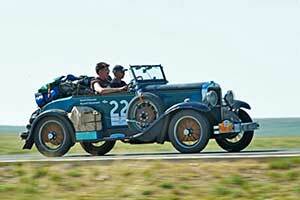 The Lagonda of Richard Cunningham is outside the hotel with a blown piston, the word is that he is hoping to get it trucked across the border into Mongolia tomorrow, and hopefully repair it on our rest-day. If this all sounds a bit grim, it ought to be stressed that just about everyone has breezed today, and has enjoyed driving empty roads…. with vast open plains on either side. Coming into town this evening, there were giant statutes of dinosaurs grazing on the grass, a reminder of an earlier occupation. 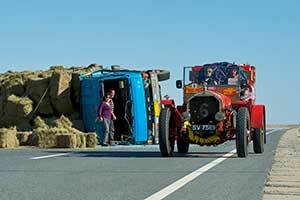 A giant truck full of hay-bales fell over after a tyre burst but fortunately left room for the rally cars to pass by. Tomorrow we enter Mongolia and tackle the first Time Trials of the event. We also leave the relative comfort of our overnight hotels for the first camping night near Sainshand.